Metal Eyelet Badge Straps - On Special Sale Now! The plastic badge strap comes with a small, metal eyelet hole for ball chains, elastic cords, or round cord lanyards. The snap button on the plastic badge strap comes with an easy-open and close function for badges or name tag holders. Just snap and go! It is great for general use purposes, sporting events, meeetings, concerts, military, trade shows, businesses, schools, and promotions. 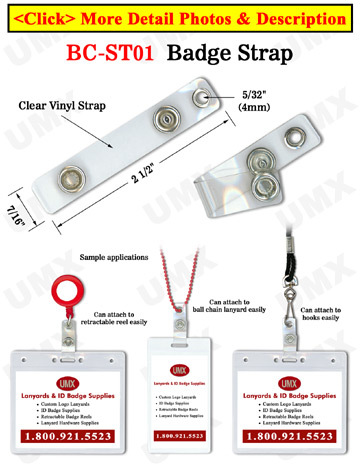 It is a low cost badge strap for those on a low budget!